Flips flops are something of an obsession for my friend Laurie. She has an extensive collection. It includes every color of the rainbow, myriad styles, and adorable embellishments. After all, she reasons, life is better in flip flops… right? If she is wearing Bumpers, I say yes. I recently discovered these unique flip flops. And, they were instantly my new faves! What makes Bumpers Flip Flops so special? Bumpers are aptly named because they have a unique “bumpy” surface. The soft, rubber bumps massage your feet’s pressure points, increasing blood flow with every step. These bumps work on both deeper and more superficial parts of the foot. So, the feeling is something like a deep tissue foot massage – ahhhh! Bumpers flip flops are created to affect specific trigger points on your feet. Each area corresponds to another point (calf, ankle, etc.) So, by massaging the soles of your feet, you are helping ease leg, calf, knee, and foot pain. Plus, they are so durable. Made with a natural and recycled rubber soles, these flip flops are so much sturdier than the inexpensive foam ones you pick up at the beach or on the boardwalk. Plus, they are vegan and non-toxic, since they are not made with harmful polyurethane resin. Of course, (most important for me) they are cute, too! 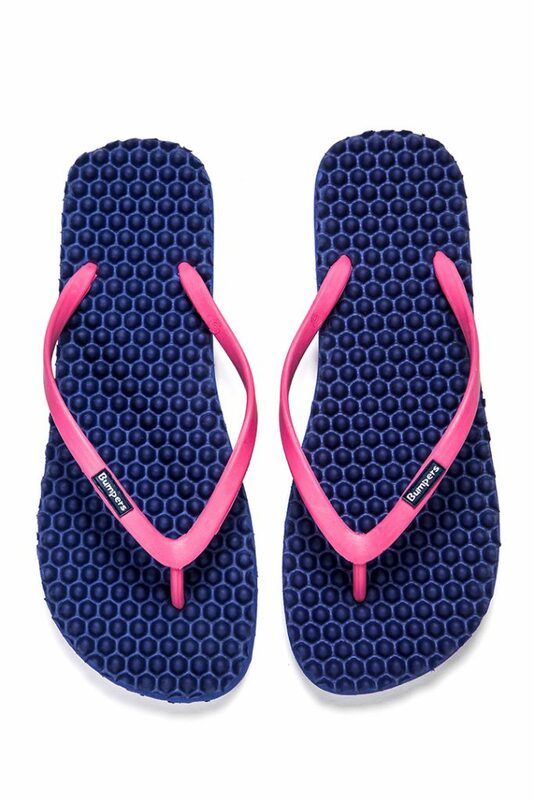 These unisex flip flops are available in a variety of solid shades, contrasting colors (navy with pink straps, for example), and even subtle patterns. There are so many choices. You are sure to find multiple must-haves. Two notes: First, these do take a bit of getting used to. I liked them instantly and found them very comfortable. But, my husband cannot stand anything bumpy underfoot. (He literally cannot even stand on a bumpy shower mat long enough to take a shower.) My advice? Take it slow, just in case. Second, pay attention to the sizing chart for the best fit. These are sized using European sizes. There are corresponding US sizes listed. However, I clicked the Size Chart and measured my foot in inches, to be doubly sure. Bumpers flip flops are available on Amazon for $24.99 per pair. Although this is more expensive than a “disposable” foam pair from Old Navy or H&M, the cost is more than worth it! Unlike cheaper versions, these flip flops are built to last. Your feet will thank you! PHOTO: Product image used with permission by Bumpers. DISCLAIMER: No financial compensation was received in exchange for this post. I did, however, receive a promotional sample of the flip flops from Bumpers in order to fully evaluate the product. Regardless, I only recommend products or services I believe will be good for my readers.